Janice (right) is pictured with her wife & business partner Brandi (left). Janice Dulce’s path that led her to create the San Francisco based pop-up FOB Kitchen was never an intentional one, but rather it came about organically from her passion for cooking for others, and her desire to share the Filipino cuisine that she grew up with to an audience that had not yet experienced those flavors. Her childhood years were spent in the Bay Area, as well as in the Philippines, and on the island of Guam. Her cooking reflects the range of flavors that she was exposed to and she often showcases dishes from Guam in addition to traditional Filipino dishes with a FOB Kitchen twist. It wasn’t until many years into her adult life that Janice realized how much she truly missed these flavors from her childhood and made it her mission to learn from the best, her Nana. Over the years, these gatherings with her family became her classroom, and her talented Nana and aunts became her teachers, sharing with her their recipes and techniques. Janice was never classically trained, however her knowledge of Filipino recipes and ingredients is expansive. She used this knowledge gained from her family to share her passion for Filipino with her close friends, and often would create hearty and comforting meals as her friends gathered. In 2015 she spent a month visiting her Nana to learn her recipes using authentic ingredients, and travelling the Philippines to truly immerse herself in Filipino culture. She came back inspired to make her vision a reality. With the support of her wife, they embarked on the adventure that would be FOB Kitchen. What began as a one day a week pop-up in an Outer Mission dive bar, has grown to a full-time kitchen serving dinner 4 nights a week, and brunch on the weekends. Every dish is made from scratch with an intention to recreate the flavors that many know and love. These dishes include her house-made spam and longanisa, to her vegetarian pancit sotanghon, house-rolled Shanghai lumpia, and signature adobo. She has been featured in the SF Chronicle, Adobo Nation, as well as other publications also mentioned Bon Appetit magazine. 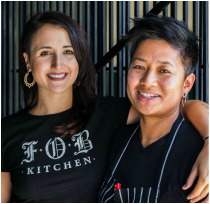 Her goal is to see FOB Kitchen thriving as a Brick-and Mortar restaurant in the Bay Area.